Watch for more pics and vids from the coming 2016/2017 school year! Students in grades 2-5 coded Sphero robots to navigate obstacle courses with Beth Koch and Ryan Kellinghaus on July 15, 2016. Interns Jake Edwards, Madison Rechtin, Hunter Clem and Braden Siebert wrote, filmed and edited this PSA for the Boone County Animal Shelter. NKY MakerSpace student intern and Conner High School student Mitchell Ellis produced and edited this track in our audio studio for the Boone County Animal Shelter to use in television commercials. Volunteer Shannon Eggleston offered her musical talents... whistling and singing the hook, "adopt don't shop". Jones Middle School, Burlington Elementary and Collins Elementary students made torches on April 1st to celebrate the Maker & Inventor Expo on April 23rd! New Haven and Kelly Elementary students crafted torches on March 30th for the upcoming Maker & Inventor Expo on April 23rd. 3/16/16 - Longbranch Elementary students made torches to represent their school at the World Maker & Inventor Expo! Pegasus Club Girls in Aerospace - Making mini hot air balloons and mini remote control blimps in preparation for the Girl's STEM Day on March 19th! The ACE Academy Invention Team has been working on a device to help surgeons with arthroscopic surgery. They visited for a field trip, teamed up with NKY MakerSpace Intern Braden Siebert and 3D printed their first prototype! Photography students studying light and liquids at NKY MakerSpace with instructor Shannon Eggleston. Gray Middle and Mann Elementary students made torches for www.TheMakerExpo.com on Wednesday, Feb 26th. North Pointe and Thornwilde students made torches for www.TheMakerExpo.com on Wednesday, Feb 24th. Cooper High School students made torches for www.TheMakerExpo.com on Wednesday, Feb 24th. Conner Middle School made relay torches for The World Maker & Inventor during a field trip on Feb 19th. What a wonderful group of students. You should be proud principal Brewer! Design school students created projects at MakerSpace for over a week at NKY MakerSpace through mid-February. They worked on a scaled design project for ACE, video interviews and Makey Makey. Students from Gray Middle School explored the video studio during a field trip with NKY MakerSpace interns to create the video below. 4th grade students from Erpenbeck Elementary made robot animals during an NKY MakerSpace field trip on 1/25/16. Our two new interns, Jake and Hunter, explored Makey Makey computer input devices on 1/4/16 and made this video. Students from Conner and Cooper High Schools visited NKY MakerSpace for a field trip and created a fun green screen video! Students and parents had a great time in the puppet making workshop with North Pointe Elementary teacher Belinda Harrett on October 29th. Watch for her next workshop in December, when she'll be teaching students to make stockings. Her classes fill up quickly so don't wait. It will be listed on our Community Education page. 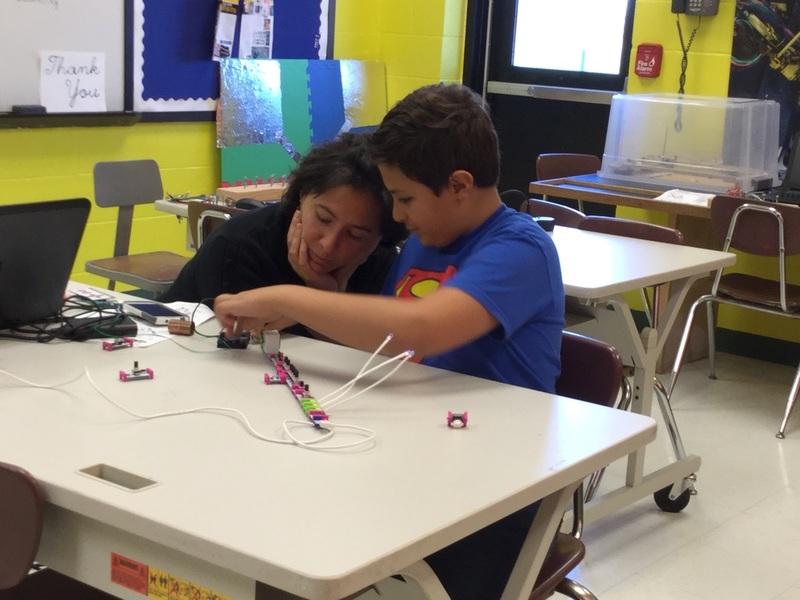 Parents and students created circuits and computer input devices with Makey Makey and Little Bits Electronics in our Engineering room on October 29th. NKY MakerSpace intern Sam Yaw photographed and edited this video below during the Camp Ernst Middle School 6th grade field trip. Inspired by sounds during the field trip, Intern Mitchell Ellis recorded and edited the music track. Mitchell created 100% of the sounds in the song using items such as Little Bits electronic circuits, ripped paper, wooden dowel rods and his voice. Super Saturday on 9/19/15 - Making Mini Corn Hole Sets Using Hand Tools With Instructor Jeff Hartline. Special thanks to Jeff's daughter, Rachel, for taking many of these photos! Maker Day on 7/23... Arduino, Aeronautics/Flight Sims, Geodesic Domes, Audio/Video Production and more! Student intern Madison Rechtin worked with Trailblazer teachers from across Boone County and edited the video below, The Power of PBL & Service Learning. Students from Boone County High School and Florence Elementary made torches on March 30th to kick off our Maker & Inventor Expo on April 23rd. Middle school students from all five Boone Co. middle schools celebrated their 3D printing clubs with a special pizza lunch picnic on 3/17/16. Seven finalists were recognized in a 3D modeling competition. 3/16/16 - Students from Ockerman Middle School and Ockerman Elementary crafted torches for the World Maker & Inventor Expo! Yealey Elementary's invention team with teacher Carly Wood on 3/14 inventing toys. Here's an update on our Brainybots, Ryle group. They have earned 9 awards and are headed to the FTC Super Regional tournament in San Antonio!! The reliability of their robot was improved by pieces 3D printed at NKY MakerSpace! Pegasus Club - Girls in Aerospace, Feb 25th. Big thank you goes out to our volunteer aviators, Bill, Jim and Tom. Looking forward to the next club meeting on March 17th, when the club will make and fly hot air balloons! NKY MakerSpace student interns Clem, Braden and Jake edited a commercial for the World Maker & Inventor Expo. Stephens and Goodridge Elementary students made torches for www.TheMakerExpo.com on Wednesday, Feb 26th. Erpenbeck & Yealey Elementary students assembled some phenomenal relay torches on Feb 19th for The World Maker & Inventor Expo. Intern Mitchell Ellis worked with students and teachers to record a track in the audio studio today, Feb 19th. Check out the track and pics below. Ryle High Schools students created torches on Feb 12th in preparation for TheMakerExpo.com on April 29th. Our Gray Middle School video competition team completed their project with Bosch! They planned, interviewed, filmed and edited the entire project. Boone County Middle Schools' 3D Printing Club students from Gray, Conner, Camp Ernst and Ockerman on 1/26/16. Invention team challenge and guest inventor Glenn Warner, CEO of Gorilla Maker! Fun with green screen in the video studio during Girl's STEM day on Nov 7th, 2015! 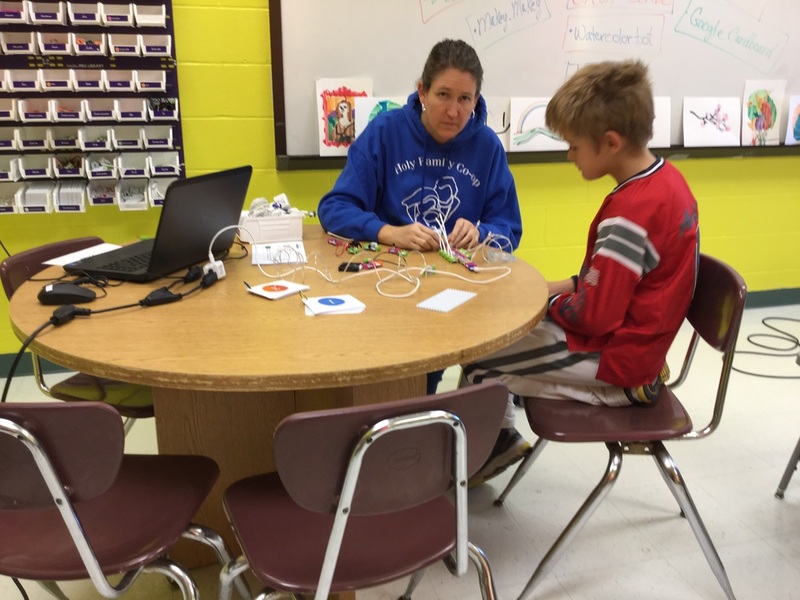 North Pointe Elementary visited NKY MakerSpace on October 14th and 15th, 2015, to explore electronic circuits and design computer input devices! It's official. Our interns began building an X-Carve CNC machine on September 23rd, 2015! 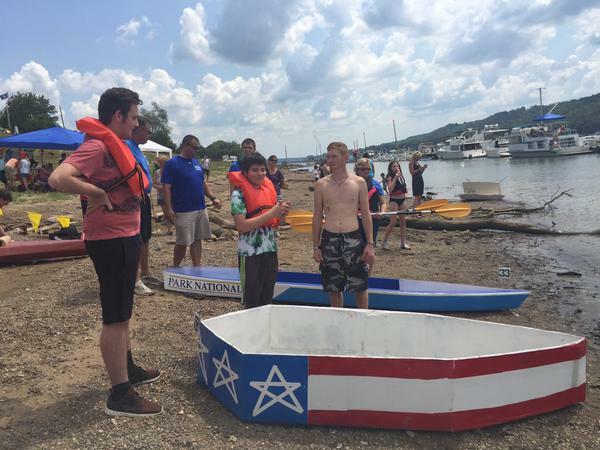 Our design school and Ace Academy students were on Channel 12 News, competing in the Cardboard Boat Rigatta with boats made at NKY MakerSpace!